Here’s a holiday-flavored recipe to close out the year. We’ve been eating it for a few weeks at my house while I tested out the recipe, and it’s gotten rave reviews. It’s great with yogurt or milk for breakfast, and we even snack on it mid-afternoon. Sweetened with pure maple syrup and molasses, it’s full of fiber and healthy fats from the oats and nuts. 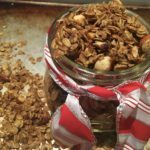 If you think that homemade granola isn’t worth the trouble, trust me, it is! You’ll never suffer through the mediocre flavors of the best store-bought granolas again. While it does require about an hour of oven time, getting it into the oven only takes 10-15 minutes and then you can sit back and relax while the wonderful aromas permeate through your house. In a small saucepan over medium heat, heat maple syrup, molasses, water, coconut oil and spices, stirring frequently, until coconut oil is fully melted. Combine oats, nuts and salt in a large mixing bowl and stir to mix. Pour warm liquid mixture over oat mixture and stir to coat well. 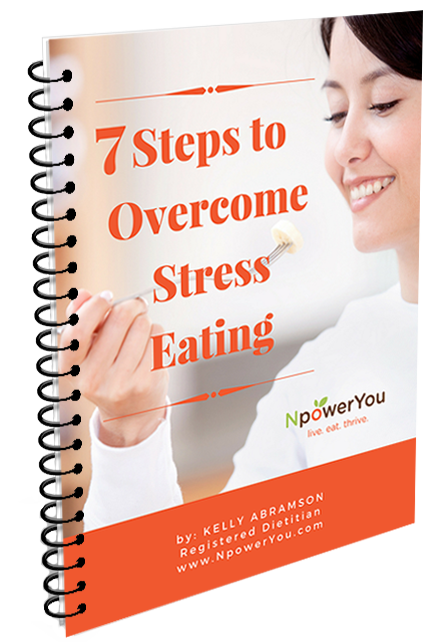 Continue to toss ingredients together for 1 minute to make sure spices are evenly distributed. Pour granola mixture onto a large cookie sheet. Using a spoon or rubber spatula, make an even layer of the granola mixture across the entire surface of the cookie sheet, pressing down lightly as you go. Bake granola on center rack for 30 minutes. Remove from oven. Stir granola thoroughly to redistribute ingredients. Make granola into another even layer, patting down gently again. Remove from oven and let granola cool completely on cookie sheet, 15-30 minutes. Granola will seem a bit soggy when removed from oven but will crisp while it cools. Store in an airtight container for up to 2 weeks. Enjoy!